In terms of value, the global nutrition bars market is expected to reach a market value of US$ 2,231.1 Mn by the end of 2026, with an anticipated CAGR of 4.1% over the forecast period. The drivers for the growth of the nutrition bars market include increasing demand for functional foods, growing health and wellness consciousness, escalating demand for convenience food, inclination towards organic nutrition bars, increasing snacking trend, fuelling online retailing, and others. Healthy eating categories are growing at a much faster rate as compared to the indulgent categories. Increasing health and wellness consciousness is motivating consumers to opt for nutritious food alternatives. The growth of the nutrition bars market is primarily driven by the nutritious and health benefiting properties of these bars, which tend to provide proteins, calcium, fibers, and other dietary supplements that the body needs. In line with the growing health and wellness consumer trend, nutrition bars have been able to cater to a broad consumer base. Besides, consumers are ready to pay a premium price for ingredients and products that have high nutritional content and are healthy, thus boosting the demand for nutrition bars. The growing demand for convenient snacking options and increasing snacking trends are leading to the rising demand for nutrition bars. Ever-increasing urbanization, and rising standards of living, accompanied by hectic lifestyles have made consumers opt for healthy and convenient snacking options. The need for nutrition bars is increasing as a budding meal replacement and snacking option that tends to fulfill the energy and dietary demands of consumers. There is a growing demand for functional foods, owing to the increasing demand for functional ingredients and food products that provide health benefits without actually sacrificing the taste or sensory qualities of the food product. The consumer base for functional foods, including nutrition bars, tends to be loyal, and hence, robust marketing strategies are allowing brand loyalty to increase rapidly. Consumers are engaging themselves in self-diagnosis by selecting healthier food alternatives, which is therefore anticipated to create stable demand for functional foods with claims to reduce bodily ailments. Nutrition bars are an excellent on-the-go product, offered under the functional food segment, and suits the demand of the working demographics who are highly dependent on snacking without compromising on the nutrition of a balanced diet. This working population captures a large part of the consumer base, which is expected to generate substantial demand for nutrition bars over the forecast period. The general perception that healthy food comes at the cost of taste has been blurred in the case of nutrition bars. Manufacturers are improving their products to such an extent, that taste is no more a barrier for nutrition bars. Improved ingredient quality and the introduction of newer processing technologies have made nutrition bars available in attractive and innovative flavor profiles. Unique flavor offerings along with ample of health benefits are anticipated to drive the growth of the nutrition bars market. Besides, some key confectionery manufacturers are focusing on updating their existing product lines with nutrition bars by introducing high protein ingredients to attract newer consumers, while retaining the older ones. Organic nutrition bars are expected to drive in new consumers who are strictly following organic-based food and beverage consumption patterns, and also increase consumer loyalty by offering guilt-free organic products. This is attributed to the recent trend of significant players investing heavily in procuring organic-based ingredients. Also, the segment is portrayed as premium, which helps manufacturers fragment out their product offerings and tap premium users, and gain a more significant profit margin in the nutrition bars market. There are rising product launches in the nutrition bars segment. Nutrition bars are available in different flavors and different base ingredients. Popular flavors for nutrition bars include chocolate, berries, nuts and almonds, coconut, and others. Besides the variety of flavor offerings in nutrition bars, key players are putting forward their nutrition bar products into specific wellness categories, such as digestion enhancement, diabetes-friendly, cognitive enhancement, and others. This trend is expected to take the main stage over the forecast period, gain strong traction in the rapidly increasing functional food market, and also achieve strong brand equity. Increasing product launches are expected to attract a large consumer base, thus strengthening the market prospects for nutrition bars. E-commerce has become an important platform that has benefited, both, consumers and manufacturers. Manufacturers of nutrition bars can promote and sell their products on a global platform, and can connect with a much broader consumer base through online retailing. Besides, consumers are also benefitting from the growing e-Commerce in the supply chain, as they have greater accessibility to various products. Consumers have the transparency to compare the products and their prices on the same platform, providing them ease of decision-making. This growing e-Commerce is thus leading to an increasing market for nutrition bars. The present study exhibits the market dynamics and trends of the nutrition bars market in regions such as North America, Europe, Latin America, Asia Pacific, and the Middle East and Africa. The report includes the market growth drivers and challenges for the global nutrition bars market, and their impact on each region during the forecast period. The report also comprises the study of the drivers, restraints, threats, and opportunities for the nutrition bars market to provide a substantial view. It also includes the value chain analysis and opportunity analysis of the market. The report explores the global nutrition bars market for the period 2018-2026. The principal objective of the nutrition bars market report is to provide insights into key developments in the market that are constantly supporting the transformation of global businesses that are associated with nutrition bars. It is very important to consider that, in an ever-wavering economy, we provide the estimated (Y-o-Y) year-on-year growth rate in addition to the compound annual growth rate (CAGR) for the overall forecast, to better understand the analysis and evaluation of the global nutrition bars market, and to discover justifiable opportunities. The unique key feature of this report is that, the evaluation of the global nutrition bars market and its relative revenue forecast is carried out in terms of absolute dollar opportunity. This is usually not considered while forecasting overall market value. Absolute dollar opportunity analysis is very crucial in evaluating the intensity of opportunity that a provider can observe to execute, as well as to contrast the potential resources from a sales perspective in the global nutrition bars market. The nutrition bars market report starts with an elaborate executive summary, the market definition of various segmentations that are included, and their respective shares in the nutrition bars market. The report also provides insights regarding the major macroeconomic factors that have a significant effect on the growth of the nutrition bars market. 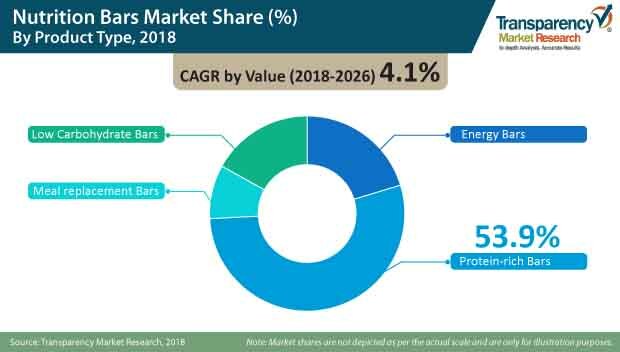 The market report further emphasizes the various dynamic factors that influence the nutrition bars market, which include the drivers, restraints, opportunities, and trends in the global nutrition bars market. The report further underlines the study of the present issues with industrial processing, and opportunities for the nutrition bars market. It also includes a value chain analysis that provides a comprehensive view of the overall profitability from the raw material supplier to the final end user in the nutrition bars market. In order to give users a clear view of the global nutrition bars market, we have exhibited a competitive analysis of the key market participants and their strategic developments. The competitive dashboard presents a detailed comparison of the global manufacturers of nutrition bars on vital parameters such as product portfolio, total revenue, key developments, and key strategies. The study presents the nutrition bars market attractiveness analysis by region, product type, format, function, packaging, nature, and sales channel. To analyze the overall market size of nutrition bars, the report on the nutrition bars market considers various preliminary aspects based on secondary research. Furthermore, it highlights quantitative estimation such as market share by product type, format, function, packaging, nature, sales channel, and region, and other qualitative data from primary respondents, which has been integrated to arrive at unambiguous and accurate market estimations. The forecast presented in the nutrition bars market report arrives at the total revenue being generated, and the expected revenue contribution in the future by the global nutrition bars market. Detailed profiles of various companies that manufacture nutrition bars are included in the report to evaluate their developmental strategies, product offerings, and recent developments, as they have a significant role in the nutrition bars market. Major market players covered in the nutrition bars market report are Glanbia Plc., Artenay Bars, SAS, Nutrition & Santé SAS, B.V. Vurense Snack Industrie, Atlantic Grupa D.D., SternLife GmbH & Co. KG, Halo Foods Ltd., anona GmbH, Prinsen Food Group B.V., Leader Foods OY, Bedouin S.A.S, Viba Sweets GmbH, and Frankonia Schokoladenwerke GmbH. The subsequent sections analyze the global nutrition bars market on the basis of region, product type, format, function, packaging, nature, and sales channel.